Professional Colouring - It's all about you. 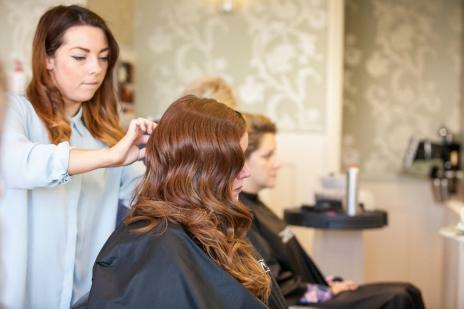 At Mia Hair we pride ourselves on creating a personalised colour for each of our guests. Come in and receive a full consultation in which we will look at your skin tone, hair fabric and condition as well as meeting the needs of your budget and maintenance. We apply our Colour Services at our exclusive “Colour Bar” using the latest American “Paul Mitchell” hair Colour. This is an area in the Salon where you can be involved with your colourist on how we formulate and mix your colour in front of your eyes. “Paul Mitchell” colour has low ammonia and beeswax which ensures maximum shine and longevity of your hair colour. Alternatively try “PM Shine” a demi-permanent treatment for your hair, repairing damage, adding moisture and providing UV protection. Mia is the only salon in Torquay, that uses the innovative highlighting tool “Color Shells”, which we import directly from the states, which are environmentally friendly and ensure close to the roots highlights. Katie Mia and Stephanie have Joined the Elite! Katie Mia and Stephanie, have become Paul Mitchell Colour Associates in Torquay following completion of an intensive colouring course at Paul Mitchell’s head office near London on the 6th & 7th November. Already acknowledged among the leading colouring specialists in the area, this qualification takes them both to the next level of professionalism. Katie Mia said “We are delighted to have this opportunity, we both love our work and to become Colour Associates with a leading company like Paul Mitchell is the icing on the cake!